"The mystery of the bizarre deaths of elite Russian hikers in a 1959 tragedy on a deadly Ural mountain is the subject of Eichar's extensive investigation. Eichar, a film director and producer, tries to make sense of the puzzling tale of the dead students from Ural Polytechnic University; he sets off to interview the hikers' relatives, investigators, and even a lone survivor. Following the search party's retrievals of the bodies, the questions deepen when the victims are discovered, insufficiently dressed for the frigid weather, shoeless, with violent injuries, including a horrible skull fracture, a leg torn away, and a tongue ripped out. With expert analysis of the remaining evidence, Eichar tries to answer why the hikers, seven men and two women, would go out into the bitter cold without warm clothing to meet certain death; curious, too, is that the contents of the tent were intact. Possible causes for the panic, according to Eichar and officials, are: an avalanche; mysterious armed men; even a fatal tiff by the males over the women. As the elements of this complicated tangle are compiled, the final wrap-up of the mountain tragedy is overwhelming, befitting a case defying explanation." "They say the best stories, the most compelling ones, are the ones based in truth that is so strange that you think it must be fiction. . . . Eichar has engaged in a Sherlock Holmes-style process of elimination investigation to what could have happened to the hikers. . . . [A] true life mystery, finally solved." "Dead Mountain reads like a mystery, with flashback chapters that lead up to the last known details of the ill-fated adventure. Author Eichar is a documentary filmmaker who fell into the 50-year-old mystery. Determined to unravel the clues, he takes a winter hike into the same mountains. His research leads him to sort through the classic explanations?avalanche, attack by the local Mansi people, high winds, armed men, weapons testing, and even aliens. 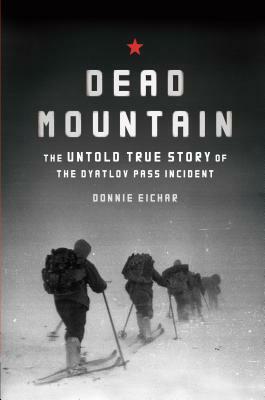 Punctuated with primary source documents, readers will be riveted to the final conclusion of the true story of the Dyatlov Pass incident." "The Dyatlov Pass incident is virtually unknown outside Russia, but in that country, it's been a much-discussed mystery for decades. In 1959, nine Russian university students disappeared on a hiking expedition in the Ural Mountains. A rescue team found their bodies weeks later, nearly a mile from their campsite, partially clothed, shoeless, three of them having died from injuries that indicated a physical confrontation. What happened here? There have been a lot of theories, ranging from misadventure to government conspiracy to freak weather to extraterrestrials, but no one has managed to get to the truth. Drawing on interviews with people who knew the hikers (and with the lone survivor of the expedition, who'd had to turn back due to illness), Russian case documents, and the hikers' own diaries, Eichar, an American documentarian, re-creates the ill-fated expedition and the investigation that followed. The author's explanation of what happened on Dead Mountain is necessarily speculative, but it has the advantage of answering most of the long-standing questions while being intuitively plausible. A gripping book, at least as dramatic as Krakauer's Into Thin Air (1997). " "Readers will appreciate the drama and poignancy of Eichar's solid depiction of this truly eerie and enduring mystery." "Five Stars...The best investigation on [The Dyatlov Pass Incident] that I have ever read." "Dead Mountain piques your curiosity from start to finish as the details of these nine young and vibrant hikers unfold to explain their brave fight for survival in some of the harshest conditions imaginable. " "An American documentary filmmaker drops into the well of one of Soviet Russia's greatest mysteries. . . . A sad tale of tragedy and investigatory enigmas from the wilds of Soviet Union."